MobCraft, a start-up craft brewery in Madison, Wisconsin, has gotten some buzz lately because of their creative financing model. While they have raised capital in some of the old-fashioned ways, they also were the first company to utilize a new Wisconsin law — one of the first of its kind in the nation — that allows entrepreneurs to “crowdsource” funding from a broad group of equity investors recruited from the general public. We’ll get to the details about that in a bit, because let’s face it, equity capitalization is really important, but it’s just not the most fun part about beer. We needn’t stray far from the topic, though: Crowdsourcing — engaging the public directly in the operation of the business — has been a core principle of MobCraft since it was started by a trio of buddies at University of Wisconsin-Whitewater in the latter part of the past decade. One of these was Henry Schwartz, now the business manager for the brewery, who visited Chicago Thursday (Oct. 16) to participate in a Chicago FoodTech Meetup roundtable discussion. With four delicious beers to share with the group, Schwartz explained how MobCraft enables consumers to participate in recommending and selecting the recipes that the brewery creates. The company’s website solicits ideas for new beer styles. The brewers select the ones they view as most promising and hold conversations with the people who proposed them to come up with a workable recipe. After a recipe has passed through the federal government approval process, it is put up for a vote on the MobCraft site, and to register a vote, a consumer needs to commit to a pre-order — thus guaranteeing a revenue stream — which will be filled if the beer wins the competition and is produced. 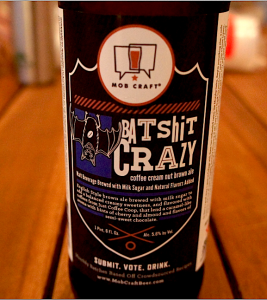 Batshit Crazy, a coffee-infused English brown ale, is one of the “crowdsourced” beers produced by MobCraft brewery in Madison, Wisconsin. Schwartz explained that the beer’s recipe was one of the first that the MobCraft team developed with their crowdsourcing technique.“We had some people say, ‘I don’t really like beer, but I like coffee, if you made a coffee beer, I’d probably drink it,’” Schwartz said. The base beer is an English brown ale, a style chosen because it is more accessible to some drinkers than heavier dark beers such as stouts or porters. Some milk sugar is added for residual sweetness, and the brewers, after experimenting with many different types and blends of coffee, settled on a cold-steeped variety which is added to the already fermented ale. 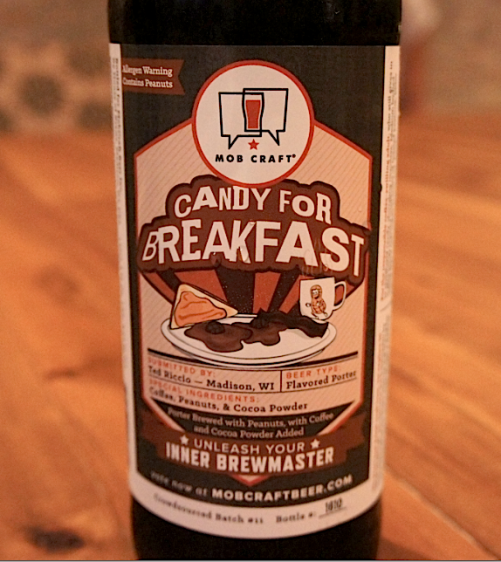 Candy for Breakfast is a peanut-infused beer produced by MobCraft, a craft brewery in Madison, Wisconsin, known for crowdsourcing both its financing and its beer recipes. 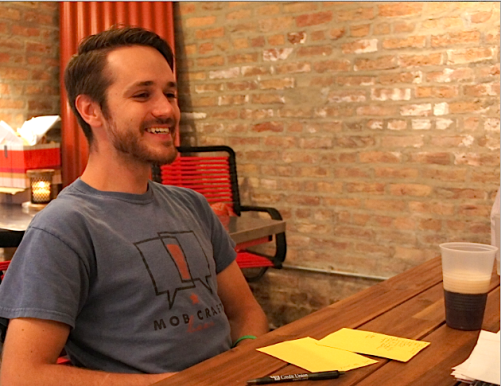 MobCraft obtains that part of the mix from the Just Coffee Cooperative, another Madison business. 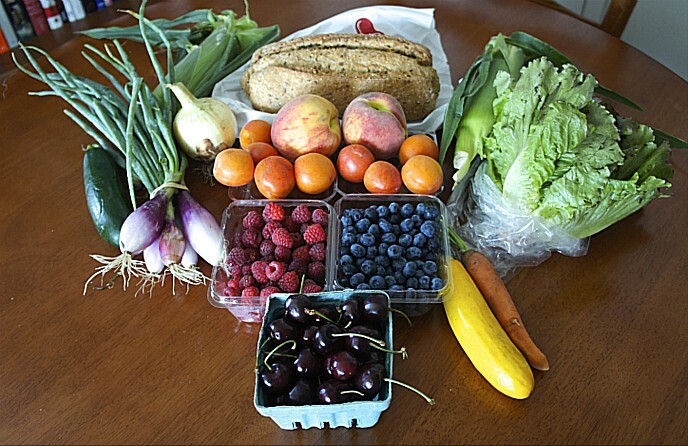 It is part of their effort to use locally produced ingredients whenever possible, which has included several types of grains and produce. 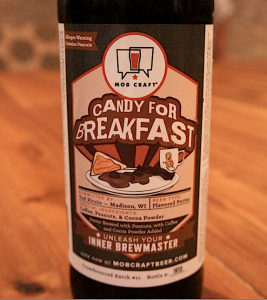 A second beer sampled, a peanut-flavored variety called Candy for Breakfast, underscores the hands-on approach the MobCrafters still are able to take with their small-batch operation. “We literally bought raw peanuts, roasted them ourselves and chopped them ourselves and threw them in the tank. In another beer, we had 100 pounds of fresh raspberries,” Schwartz said. He added that the team recognizes they will have to make some accommodations to this practice as the brewery grows. “When you scale and you start making a lot higher-volume beer, it gets harder to put an expensive beer in a 12-ounce can. Some of the recipes will be dialed back,” he said. And MobCraft has definite plans to grow. Currently operating a relatively small brewing system in rented space, the company is hoping to raise enough financing to build its own brewery within the next 18 months. Which brings us back to the crowdfunding matter. Wisconsin’s law, which went into effect this summer, implements new federal rules allowing a broader group of investors to participate in equity financing. It loosened provisions that previously allowed only “qualified” (i.e. very wealthy) investors to join equity pools, which made for a very small crowd in such crowdfunding strategies. While MobCraft uses more conventional means to raise capital, Schwartz said the crowdfunding model is especially useful to food and beverage companies that need to expand their consumer base to grow. “That’s why I really like this model and it works really well for food, because these people are not only becoming investors, they’re becoming brand ambassadors. That’s so much more important than having one huge investor,” Schwartz said. 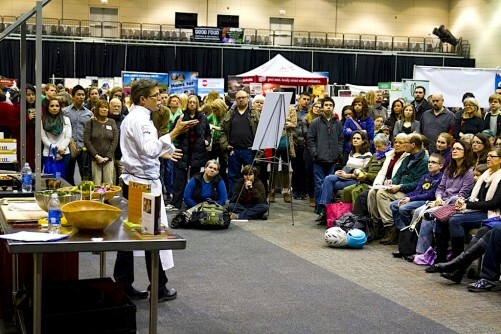 The subject of crowdsourcing will likely be on the agenda at the 11th Annual Good Food Festival and Conference staged March 19-21 at Chicago’s UIC Forum by FamilyFarmed (the publisher of this website). FamilyFarmed is expanding its commitment to entrepreneurial opportunity in the local and sustainable food markets with the recent launch of its Good Food Business Accelerator. This entry was posted in Beer, Craft beverages, Fermentation, Food and technology, Food Artisans, Food Entrepreneurs, Good Food movement and tagged craft beer, crowdfunding, crowdsourcing, food and beverage crowdfunding, food artisans, Food Entrepreneurs, Good Food Business Accelerator, Good Food Festival & Conference, MobCraft. Bookmark the permalink.